The price includes: transport, guide, refreshments and dinner. The Suchá Belá Gully is the most famous, most beautiful and at the same time the most romantic gorge within the aptly named Slovak Paradise. It’s accessible through a series of ladders, bridges and risers. 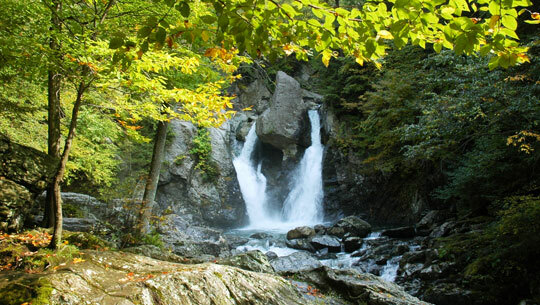 The hike begins in Podlesok, where we go through a blooming meadow towards the beginning of the Suchá Belá gully to the first waterfalls of the gorge named the Michael’s Waterfalls. This place is also the starting point for the more difficult hike up through the gorge. The track continues with the help of the aforementioned ladders and risers through the narrowest part of the gorge, located underneath the Window Waterfall. After climbing through the rocky window we’ll reach Channel waterfall, famous because its stages are divided with a massive erosion pot where the water brutally spins. The last few ladders and risers continue until we reach the maintained spring of the Suchá Belá gorge. After a short refreshment with crystal clear water we continue down a concrete road until we reach a tourist shelter with seats on the highest point of our hike: Sucha Belá - Vrch (959 m). After a little rest and a refreshment the track down to Podlesok awaits. This is usually via a groomed forest road with multitude of interesting views of the High and Belanské Tatra Mountains and of the Spiš countryside. Our track down will take us to Kláštorisko. This location is interesting because of the ruins of an old curtisian monastery and a local sundial clock. The final part of our tour will take us through a mild decline from Kláštorisko to Podlesok. The most suitable shoes are gumboots or at least a heightened hiking boots due to the risk of higher water levels during the trek through the gully. You can make the trek in sneakers however it is not the most ideal footwear for this terrain. The price includes: transport, a guide and a welcome drink of “Frndžalica“. The trip begins outside the Riverside hotel, from where we will go to the high mountainous lake Štrbské pleso. It is a moraine-dammed lake, formed by a retreating glacier. It is beautifully lit during the evening hours, creating a multicolored atmosphere and unforgettable experiences. A visit to a pretty “Koliba” (traditional house) where you can choose from a multitude of Slovak specialities (sheep cheese dumplings, pirohy) and a taste of true slovak “Frndžalica” (burning drink) is a curious part of the evening walk. Its name is taken from a little village Štrba. Štrbské pleso is the most beautiful and the second largest natural lake on the slovak side of the High Tatras situated 1346 meters above sea level. It covers 19.76 ha in area, the depth is 26 meters in some parts and it is fully frozen 155 days a year. Štrbské pleso was a lot smaller in the past and its water level was 6 meters less than currently. Because there are no visible inflows or outflows, there is the possibility that the water level rose around 1642 when there was supposed to be a very strong earthquake in the High Tatras which probably caused blocking of the seepage and during the next few years to at most a few decades, the water level rose to its current state. An interesting fact about Štrbské pleso is that it lies almost on the water divide of the Baltic and Black seas. Scientists anticipate that the water from the lake outflows to both of these seas. Pleso was being artificially filled with fish until the end of the 19th century and during winter ice was being broken on it for cooling plant purposes, as the ice was unbelievably clear and was very sought after. It was exported into Budapest, Berlin and Vienna. Another interesting fact of Štrbské pleso is an individual endemic appearance of the Sih Maréna species of fish. It is most likely the last place on earth where this fish can be found in its genetically pure form. From Hotel RiverSide we drive you to amazing place called Red Monastery (Červený Kláštor), where is departure station for sluice down on wooden raft. Certified People whom we called ,,PLTIARI´´ will take care of your safety, excitement and information of all sluice down for approx. 1,5 hour. At the end of the sluice down you will find a nice quite place for refreshments, various sporting activities and relax. The tour will finished with safe return to the Hotel. 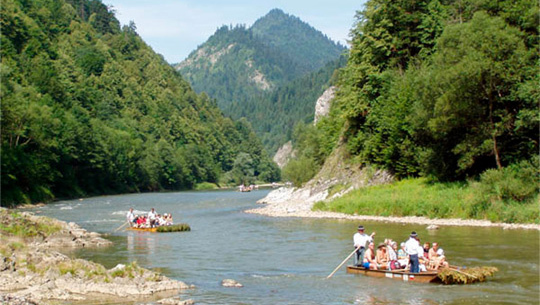 As first thing is unique sluice down on wooden raft at border river DUNAJEC in National Park PIENAP, which is the smallest park in Slovakia. This river makes a border line between Slovakia and Polland for 17 km. The dominat of surrounded nature is landscape on Theer Crown with the highest peak called Okrunglica (982 m). Narrowest place on the river´s called Janošik (Brigand) jump with a width of 10 meters and deep only 12 meters. Price include transport on place, guide and traditional Slovakian snack (approx. for 3 EURO/ per person).. 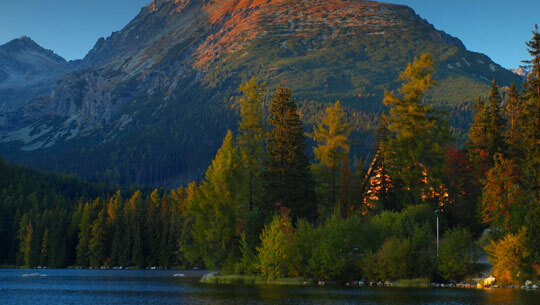 This beautiful valley has got possessive name “The most beautiful valley of Slovakia”. It is full of the unique natural phenomenon; one of them is Jánošik head which “cries” during rainy days. At the place named Kobyliny is an excellent view to the Valley of Kvačianka River. The next view point with another excellent view is located at Little Roháč from where you can see the upper part of the valley and big rocky needle. 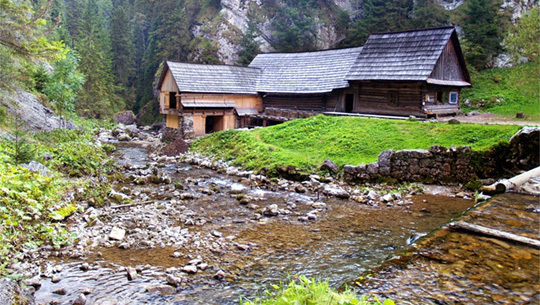 At the upper end of the valley are placed the water mill with appearance as from the story tale and all that being amplified by nearby located Ráztocký waterfall, where we can take a nice peaceful rest in the extremely amazing environment. This trip is OK for any person of any age, even is simple, but for its unique natural environment and monuments will be a big shame to miss it. Believe us that it is really highly recommended to do not do it. Even this tour is suitable for anybody, we recommend you to have a hard boots and waterproof clothes if situation will required. Price include transport on place, guide and traditional Slovakian snack (approx. for 5 EURO/ per person).. In the year 1993 was Spis Castle and historical monuments around listed as UNESCO World Heritage. Into this group of monuments are considered besides Spis Castle also The Holly Spirit Church in Žehra, Spišská Kapitula (Spis Chapter House) with Spišským Podhradím (Spis Extramural Settlement) and the protected travertine areas Dreveník and Sivá Brada (Grey Beard). In 2009 was at the list of World Heritage extended with the medieval city Levoča and the work of art from medieval wood carver Master Pavol. The official name of the entire site is now Levoča, Spišský hrad and surroundings’monuments. At the beginning of our mysterious trip we arrive to the one of our largest castles located in Slovakia, which is situated at the travertine uphill in the cadastre of village Žehra , suburb Hodkovce. His size was built from 12 century by connection of upper and bottom castle with different walls until current appearance about 4 hectares of size. 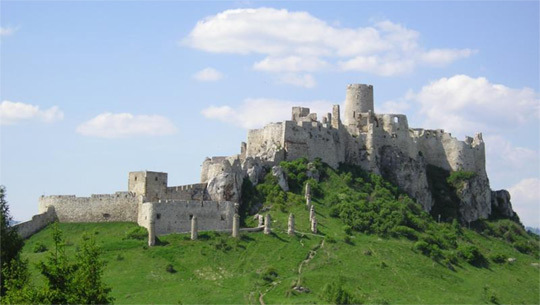 Spis Castle became thanks to his position in the landscape at the border of regions Spiš and Šariš as inseparable part of the site and with its picturesque majesty fulfils the local colour. After visiting Spis Castle we will move a little be it next for the exciting walk over the ridge of the travertine massive named Dreveník, which besides the other attractions has one unique curiosity that there is the chasm ,,Peklo´´ (Hell) a rocky town ,,Kamenný Raj´´ (Rocky Paradise). Dreveník is the oldest formation of its own type around the Spišského Podhradia (Spis Extramural Settlement) and the largest travertine area in Slovakia with the solitary flora and fauna. Another travertine massive but much smaller than Drevenik which we will visit later on is a travertine hill Siva Brada (Grey Beard) with small chapel at the top and at the bottom with the spring of refreshing water naturally enriched by CO2. From this picturesque area we move afterwards slightly to the North East part of village Spišské Podhradie, where is located historic cathedral St. Martin, by locals called as ,,Spišská Kapitula´´ (Spis Chapter House). In nowadays there is a Bishop domicile and centre of the Spics diocese, where this diocese covers almost the entire historic area of the region Spis , Liptov and Orava. Very often referred as small Slovak Vatican.